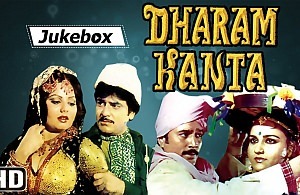 Thakur Bhavani Singh heads a gang of dacoits, who have spread terror and fear in the region. Bhavani has a family, consisting of his wife, Radha, and two sons, Ram and Laxman, and a daughter named Ganga. One day Bhavani kidnaps the son of wealthy Harnam Singh, and will release him for a hefty ransom. Harnam agrees to all the conditions, and hands over the money to Bhavani. Unfortunately, Harnam’s child is killed, and his wife, devastated, curses Bhavani and his family. Subsequently, Bhavani is separated from his family due to heavy rains and floods, and decides to turn himself in to the police, and is sent to prison. His wife has been unable to locate any of their children. Ram and Laxman are taken in by two bandits, and turn to a life of crime, and ironically Ganga is adopted by Harnam Singh.